I enjoy occasionally cooking with the better known (at least to me) Moroccan couscous, but today purchased the small pea-sized Israeli couscous. Inspired by ideas on an American Culinary Federation website, I simply boiled the couscous in water for about ten minutes till al dente. In the meantime, I began sauteeing shallot, two kinds of bell pepper (orange and lavender), various mushrooms, and cabbage. I drained the couscous and added to the saute. I also added some seasoning (including hot sauce, salt, and Kermit's Fresh Lime and Datil Pepper Seasoning) and cooked just for a few more minutes before serving. I picked up from Whole Foods today some "onion bialy focaccia". I used to love eating bialies in New York City - soft yeasty rolls topped with carmelized onions - and don't remember really seeing them outside of N.Y.C. What Whole Foods had was an interesting fusion that was more like focaccia flat bread with onions instead of spices on top. In any case, I simply heated it and served it with dinner - it was good! 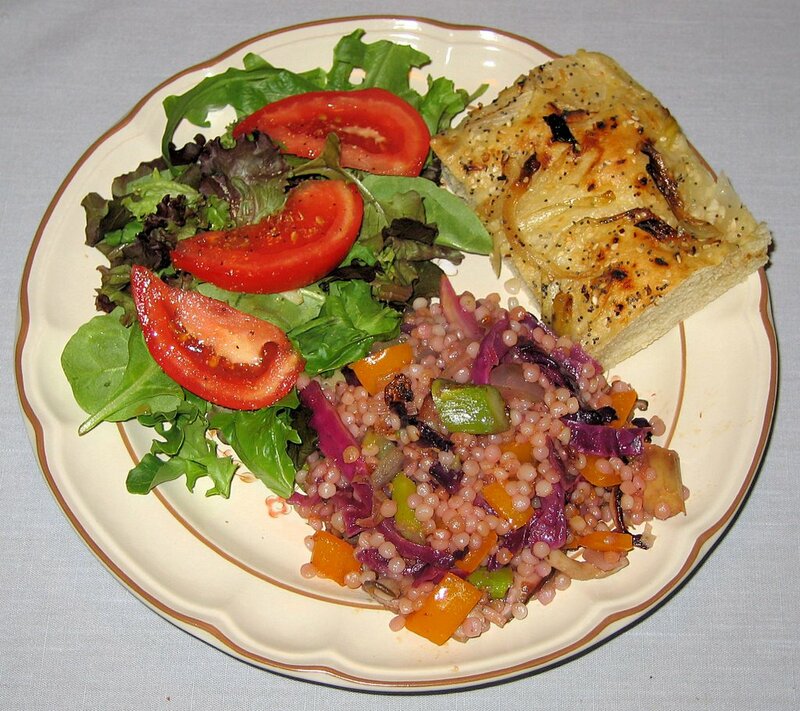 I was quite pleased with Israeli couscous and will try making a similar dish soon, but will add a little more flavor by boiling the grain in vegetable stock. Also, I think the dish I made had too great a couscous to vegetable ratio. 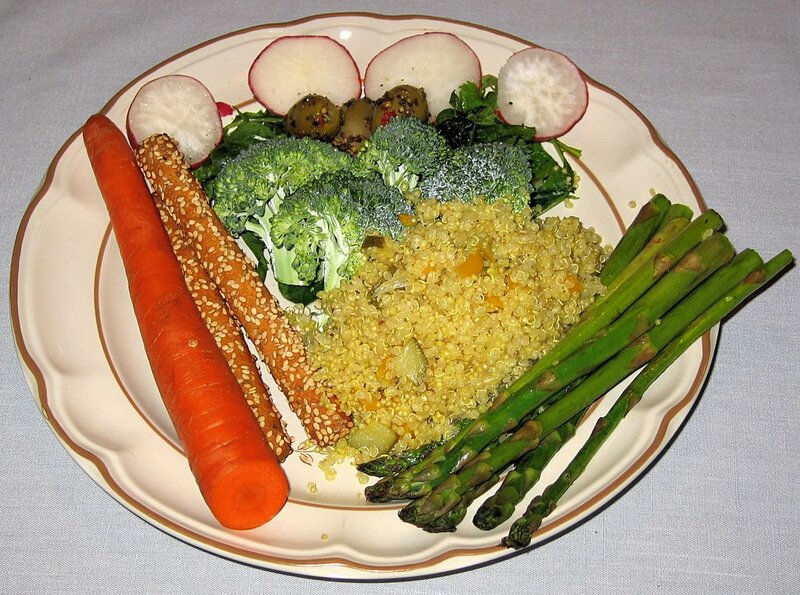 In spite of these changes I want to try, I thought that the couscous gave a nice firm addition of relatively neutral flavor to "bulk up" the vegetables, and enjoyed what I came up with. Other variations I plan to try, as recommended on the website, are to simply add the couscous to soup and simmer it for 10 minutes till al dente, and to cook it till al dente and then stuff it into squash or bell peppers and bake. There were no entries for Monday (Memorial Day) or Sunday. 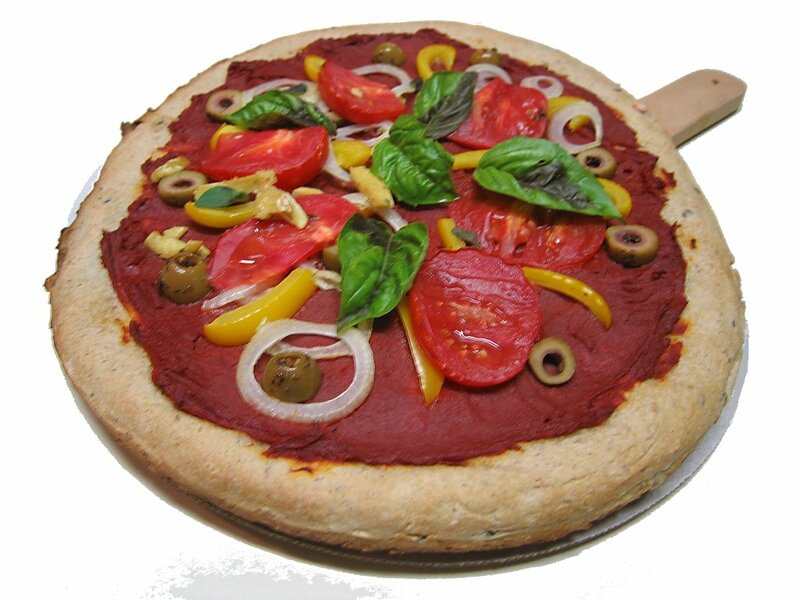 I was out and about both days and ate vegan pizza one day and at the Whole Foods deli the other. With my wife's help, I did well at the rose show today, with my large arrangement winning a blue ribbon and an American Rose Society Artist Award! My miniature came in a close second prize in its category. But after waking up at 4:40a and being at the show till around 5p, we were so tired that my wife slept from about 6p till 8a the next morning! 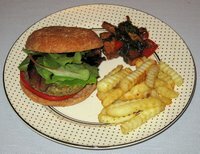 I didn't have much energy, so made a simple meal, similar to what I did back on May 13, when I made a late night dinner with French fries an organic sunshine burger (a non-soy vegan "burger"). Today I included some balsamic marinated tofu that Whole Foods sells. I really like the Field Roast "Grain Meat" [my quotes] Company's "sausage" (especially the apple sage one), and recently purchased their handmade stuffed (with apples, squash, and mushrooms) Celebration Roast. I tried a small slice cold as I was working on dinner and it was good. 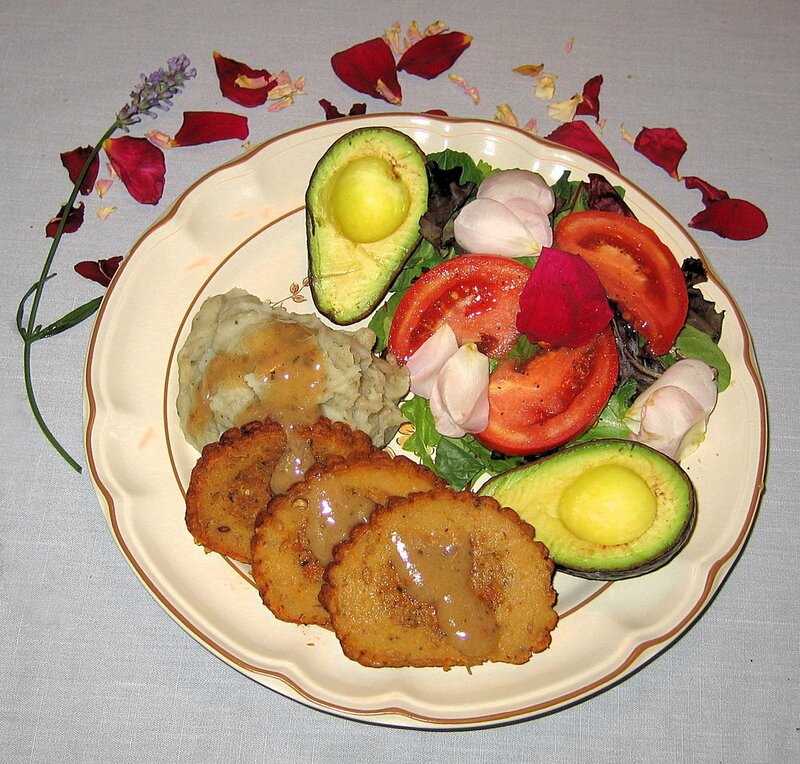 I simply heated the roast in my toaster oven while I made the rest of the meal - mashed potatoes with roasted garlic and herbs, and a salad sprinkled with organic rose petals from my garden in commemoration of the fact that I'm basically ready for tomorrow's rose show! I didn't want to take the time the night before the show to prepare a gravy, so tried a bottled Thai Sesame Lime dressing/marinade from Drew's - it was good, added needed moisture to the roast, and gave a unique and pleasing taste. We really liked the warm roast but it does make you thirsty and is very filling! I set aside a little before heating, and may slice it thinly and make sandwiches. I bought some beautiful organic rainbow chard yesterday and cooked it today. I cut some sweet Vidalia onions into thick slivers and did a light saute in a saucepan with olive oil over medium heat. As the onion was sauteing, I added a few pinches of turmeric and prepared the chard leaves. The chard was very fresh and easy to work with; I just washed each leaf then with my fingers (the leaves wereh so tender that no knife was needed) stripped the leaf off of the stem. When the onion was getting translucent, I added some raw chickpeas that my wife had been sprouting. After stirring for a minute or two, I added a few teaspoons of water and roughly cut, again with my fingers, each chard leaf into maybe approximate quarters and put the chard and fresh oregano leaves into the pan. I brought the liquid to a quick boil then covered the pan and reduced the heat, cooking for about 4 or 5 minutes. I mixed in some crushed red pepper and served this tasty dish. 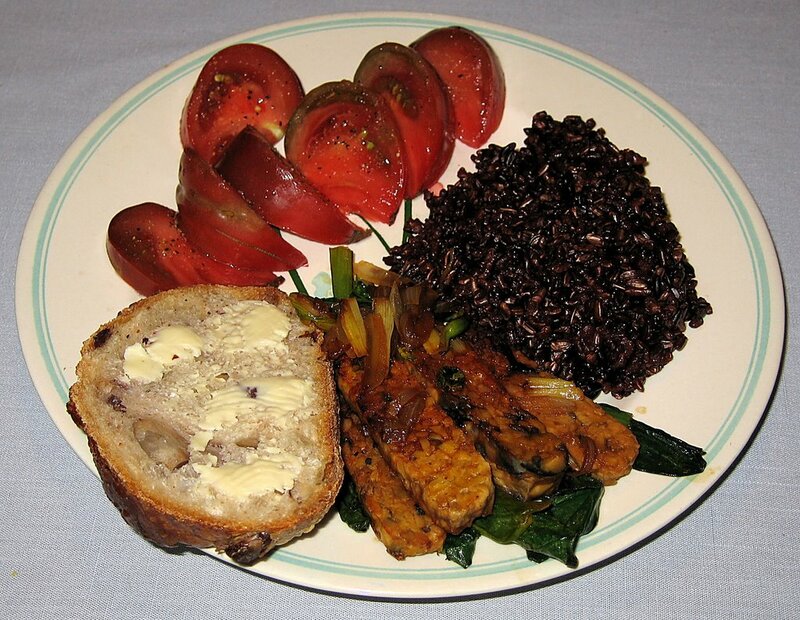 I also made some wild rice and served tomato atop oat bread. Tonight I made a simple broccolini dish. Also known as asparation, tender stem, and baby broccoli, it is a cross between broccoli and Chinese kale. I blanched the broccolini quickly (I brought water to a boil then submerged the spears for about a minute, then plunged them into cold water) then added it to a saute pan where I had slivers of garlic sauteing in mainly olive oil but also a little hot pepper sesame oil. I did a quick stir fry for about a minute or two, tossing some sesame seeds in and, at the end, a little organic hot sauce. In the meantime, I was roasting some garlic. Into my small ceramic roaster I put a bulb of garlic (that my brother brought back for me from a farmer's market in southern California) that I had cut off about a quarter inch from the top, exposing the cloves. I dripped a little olive oil into the exposed garlic, maybe half a teaspoonful, and covered the roaster. Normally, I'd like to roast the garlic slowly, maybe for almost an hour at 350°F, but I needed it sooner, so put it in my toaster oven at its maximum temperature (I think it was 475°F) for about 20-25 minutes. The garlic came out with the clove tops looking golden brown and the cloves quite soft so that I could gently squeeze them onto some lemon boule bread. I also put one roasted clove into the center of an avocado - it was a tasty combination! 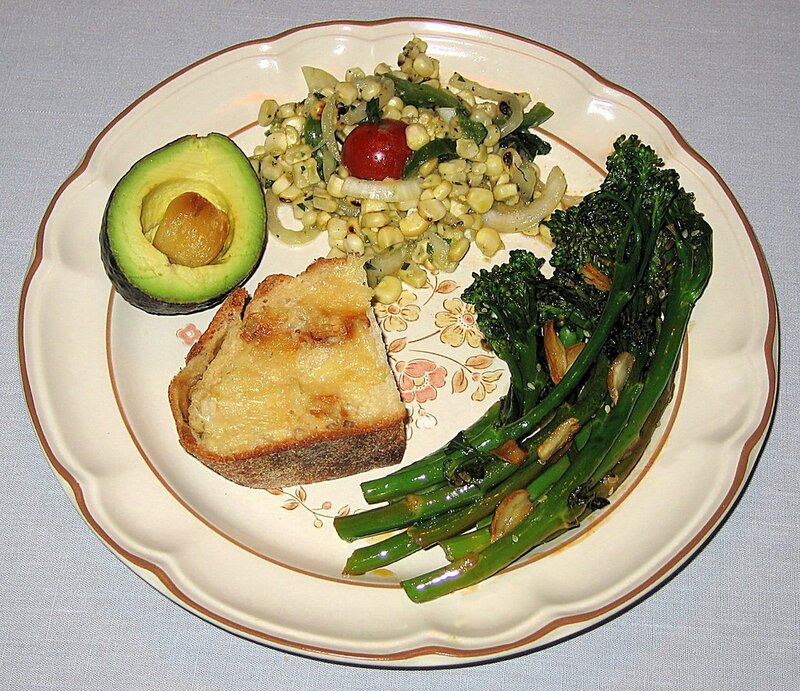 I was shopping at Whole Foods Market earlier, and found some amazing grilled corn salad that I couldn't resist, so included that as a great side dish. I'm happy that fresh corn is starting to appear, though I've not seen organic cobs yet. This salad was great and had in it: corn, locally grown sweet Vidalia onion, bell pepper, cherry tomato, avocado, jalapeno, garlic, white wine vinegar, olive oil, dijion (? I think they mean Dijon mustard), salt, black pepper, basil, and parsley. 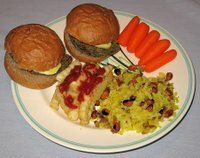 We had a vegetarian society potluck at an unusual time, mid-afternoon, today, so we weren't very hungry at dinner time. I sauteed, in a little hot pepper sesame oil, kale with scallions and shallots. When the dish was done, I put a little soy sauce in before serving it. One of the attendees of the potluck came quite late when folks were starting to leave, and asked people to take samples from his dish home. It was a tasty sweet potato and butternut squash dish, and I heated it up to serve with dinner. 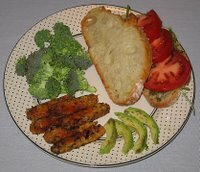 Finally, we had some heirloom tomato wedges with fresh basil and oregano from my garden, as well as a carrot. I had some baby artichokes that I had cut the top third or so off and was preparing to steam, but then I got an idea from a Watsonville (in California where the vast majority of artichokes are grown in the U.S.; I've enjoyed visiting several times!) farm's web page. I removed the tough outer layers of leaves till I got to fairly tight and lighter colored ones, cut the bottoms and a little more of the tops off, then quartered them and placed them in lime juice to avoid discoloration. I chopped some garlic and sauteed the artichokes, garlic, and some oregano and rosemary in artisinal extra virgin Greek olive oil. Near the end of the saute when the quarters were browning, I took an excellent suggestion of my wife's and added some pine nuts to gently brown as well. I served the artichoke quarters atop quinoa. For the quinoa, I quickly sauteed a little carrot and onion in very little oil then added the quinoa grain and vegetable broth in a 1:2 ratio. I brought the pan to a boil, simmered for about five minutes, then simply covered the pan and took it off the heat - in about 15 minutes all the broth was absorbed. I also quickly steamed some purple asparagus. 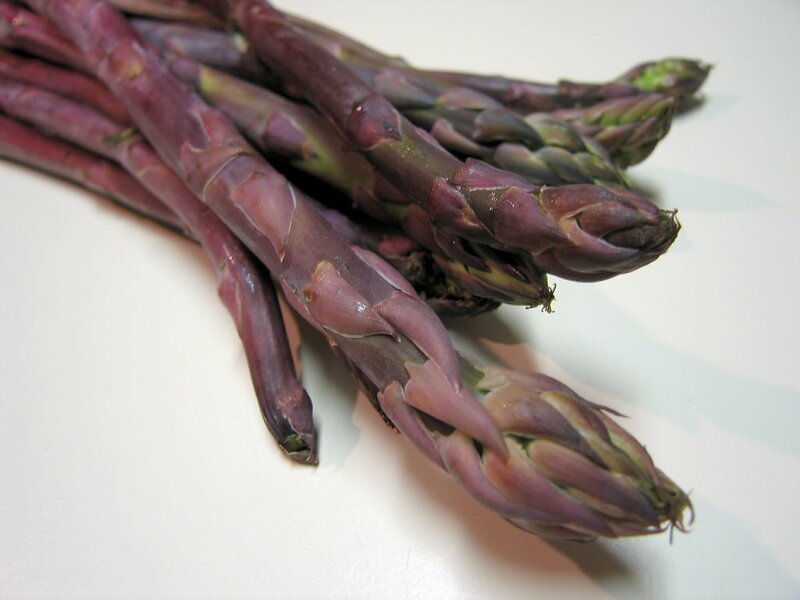 I had never seen purple asparagus before, and read that it is so sweet that it can even be enjoyed raw (I tried it and it was decent, but steamed was better). I first sprinkled some lime juice on the asparagus to try to keep the gorgeous deep violet-purple color, but after just 5 minutes of steaming, the color was mostly gone. Finishing up the dinner was a wheat English muffin with pesto and heirloom tomato. 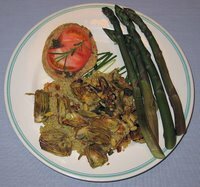 I'm glad I learned a new technique for preparing artichokes - they were good! Yesterday I attended a very interesting 4-hour photography seminar that didn't give me time to cook, so I stopped at Whole Foods Market and made a hot- and cold- salad plate for myself. On Tuesday, it was my Dad's birthday; my parents came over for some good South Indian dishes that my wife prepared. 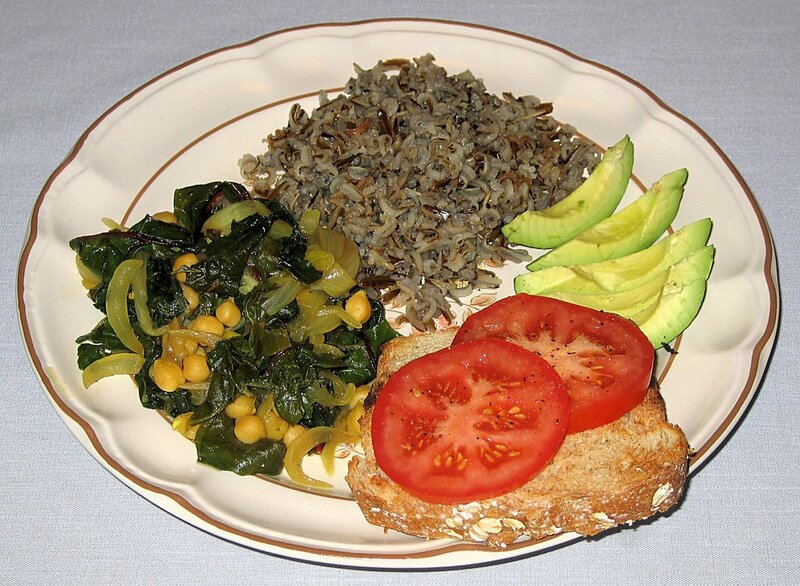 I sauteed some baby bok choy, onion, and nira grass (Chinese chives) with tempeh, and served it with a wild-brown rice mixture, herbed olive sour dough bread, and heirloom tomato slices. Today was Mother's Day and we spent the day with my parents. We didn't get home till late and I invited my parents over for dinner, so I made a quick meal. My Dad was asking for pizza since last week, so I used a prepared sourdough crust from Rustic Crust, Tuscan Six Grain, with many interesting ingredients (unbleached/unbromated enriched wheat flour, water, rye, barley, oatmeal, linseed, millet, sesame seed, yeast, culture, olive and soybean oils, salt, and spices). I topped the pizza with tomato paste, yellow bell pepper, onion, spicy olives, heirloom tomato, fresh herbs from my garden, and a little bit (just for my slices) of vegan Scheese "cheese" with chives. 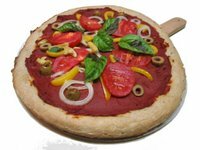 The crust was quite good, soft inside and crusty outside (I have a heavy pizza stone almost the full size of a rack in my oven that I always leave in the oven and that I directly cooked the pizza on, as usual). I also reheated leftover barley soup from several days ago. I had wanted to make risotto with spinach earlier in the week but hadn't; I had some fresh organic spinach and rather than wait on using it, simply boiled it and served it, as well. My wife had sprouted some mung beans, so they, with a fresh oregano leaf, key lime juice, and baby carrorts served as a little salad. Tonight my wife ate on her own and it ended up being very late (past 1a! ), so I made a simple dinner for myself. 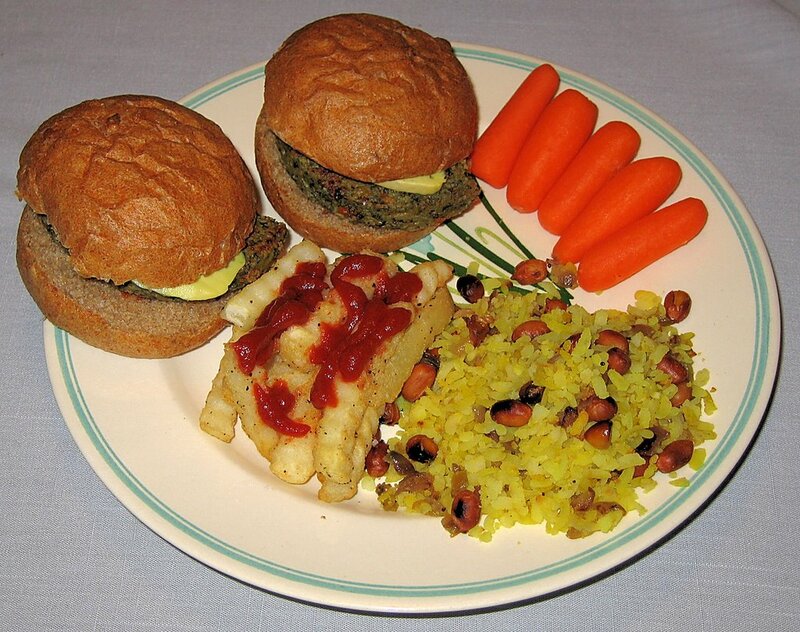 I grilled an organic sunshine burger (I like this product as it is soy-free and my wife sometimes has difficulty digesting tofu and non-fermented soy products) and served it as two halves on two sunflower seed buns with vegan Scheese cheddar style "cheese" with chives. My wife had made Indian flattened rice poha with peanuts early in the day, and I had some as leftover. I also had some french fries. Last night, my brother was ending his almost week-long visit and suggested that we head to the airport a little early so that we could get some good South Indian food from one of my favorite local restaurants, Tower, just down the street from the airport, where we had a too-hurried dosa (South Indian crepes) dinner. On Thursday, I taught and we ate out, as we usually do - it turned out to be a mediocre experience at a relatively new Malaysian and Thai restaurant on the "main drag" Franklin Street in Chapel Hill called Penang. The service was surprisingly rude from the moment we entered (and progressively got worse), and the food was not particularly tasty. I made a simple dinner tonight. 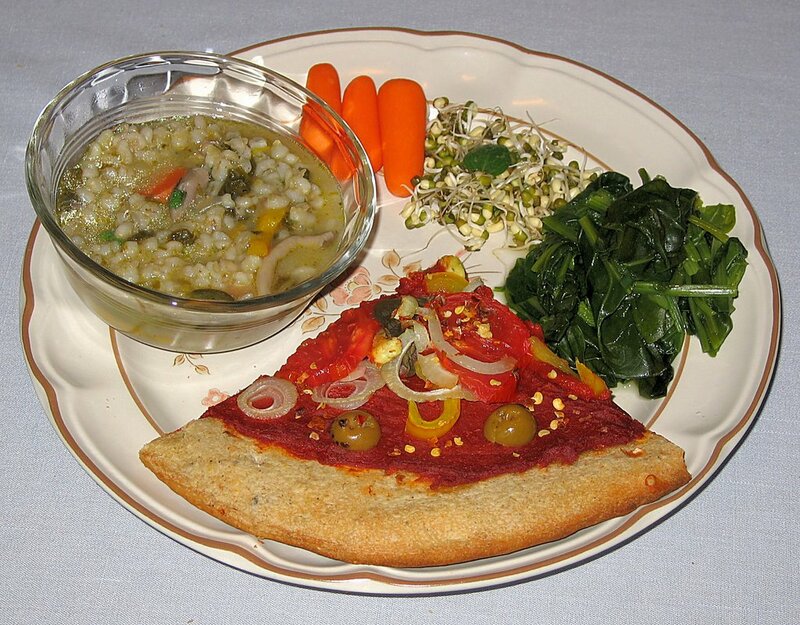 I sauteed zucchini slices with onion and yellow bell pepper and a few mustard seeds, then added quinoa and vegetable broth in a 1:2 ratio, along with a little salt and turmeric. Once this came to a boil, I reduced the heat and simmered it for about 15 minutes (alternatively, quinoa can be made by simmering for 5 minutes and then turning the heat off and letting it sit for 15 minutes), then served - easy and nutritious, as quinoa is one of the foods that supplies a nutritional profile nearly exactly mirroring what we need! 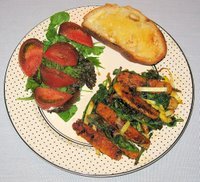 I served some grilled asparagus, salad, and breadsticks, as well. 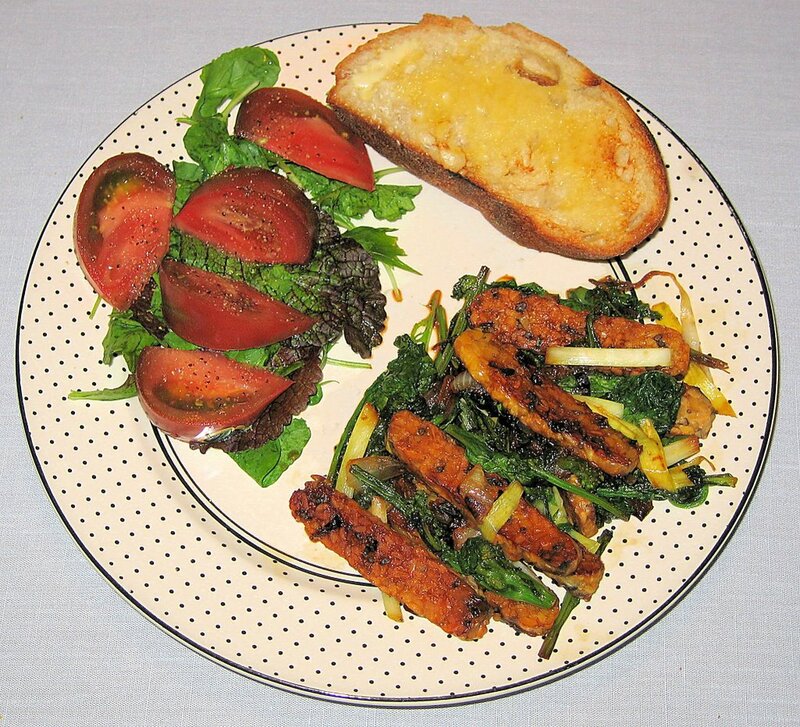 I sauteed tempeh with onion and broccoli rabe (rapini). The greens, of course, cooked way down even after just a few minutes. I served this with remaining lemon sourdough boule, lightly toasted, and heirloom tomato with locally grown spicy mesculun mix. We are having unusually cold weather yesterday and today, even requiring a jacket - in May! I don't usually serve soup, but today decided to make a hearty soup. 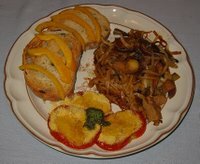 I sauteed some onion, a few types of mushrooms, and a small amount of poblano and yellow bell pepper. 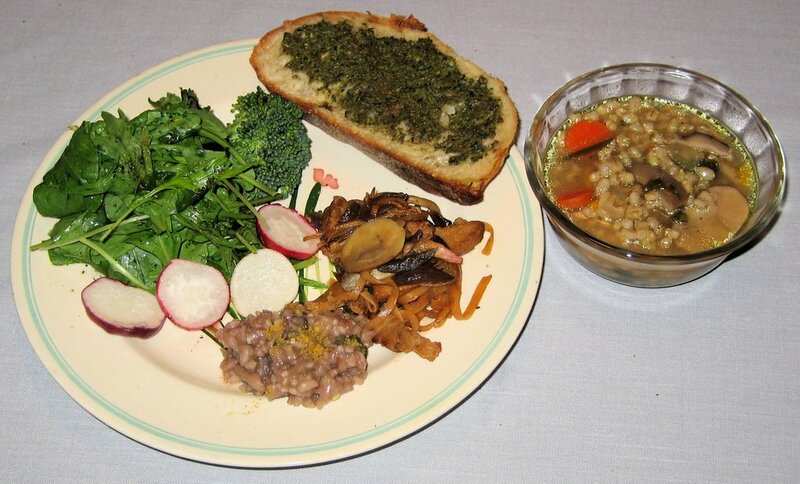 Then I added pearled barley and 4 times as much vegetable stock as grain, and simmered for about 40 minutes, adding as well carrot slices, a little red wine, fresh herbs from my garden, and a few seasonings. 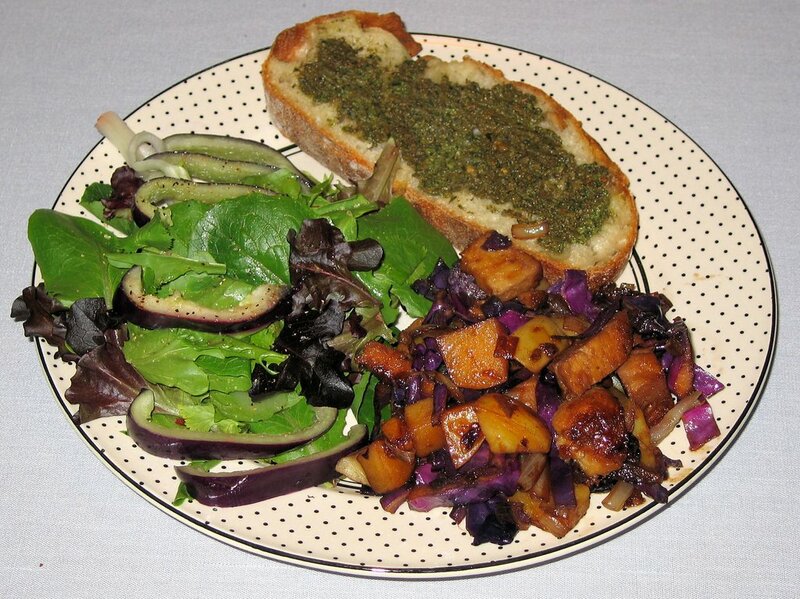 We finished off leftover risotto and rice noodles, and had a little salad and lemon sourdough boule with pesto. One of my brothers is visiting my parents this week; he arrived yesterday, and last night, we all ate at my parents' home. My Mom made a number of dishes like sauteed potatoes, dhal (lentil soup), rice, flatbread, and salad; and my wife made usal, a Marathi (the state that Mumbai or Bombay is in) specialty with sprouted lentils, as well as fresh coconut chutney. 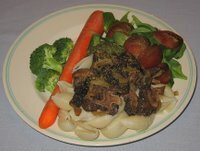 Tonight I sauteed some freshly purchased morel mushrooms with a little onion and served them atop artichoke pasta. The heirloom tomatoes with mache (lamb's lettuce) baby lettuce greens, carrot, and broccoli were the raw components of the meal. I bought two green tomatoes recently and they ripened to red on my counter-top in a few days. I had thought of making a version of the traditional Southern fried green tomato dish (I never deep fry, but would saute), but instead made baked tomato slices. Onto a baking plate that was sprayed with a little olive oil, I placed thick tomato slices, a little bit more oil, and tortilla crumbs. I put a dab of Earth Balance margarine on top and baked in a preheated 350 °F oven for about 20 minutes till the tomato slices had shriveled just a little and were tender and firm. I served the tomatoes with a dab of homemade pesto. My main course was a simple saute of seitan (wheat gluten), mixed mushrooms, red onions, and shallots with rice noodles and soy and hot sauces. I also finished up the loaf of olive bread. Yesterday I taught and we ate out, meeting a friend who was on a business trip from Charlotte. We ate at a nice fine Italian dining establishment, Il Palio Ristorante in Chapel Hill (NC). The decor inside and out was classy and gorgeous, but, at first glance, the menu wasn't very appealing from a vegetarian perspective. However, I had called ahead and they expected us and said they could make items not on the menu to satisfy us. 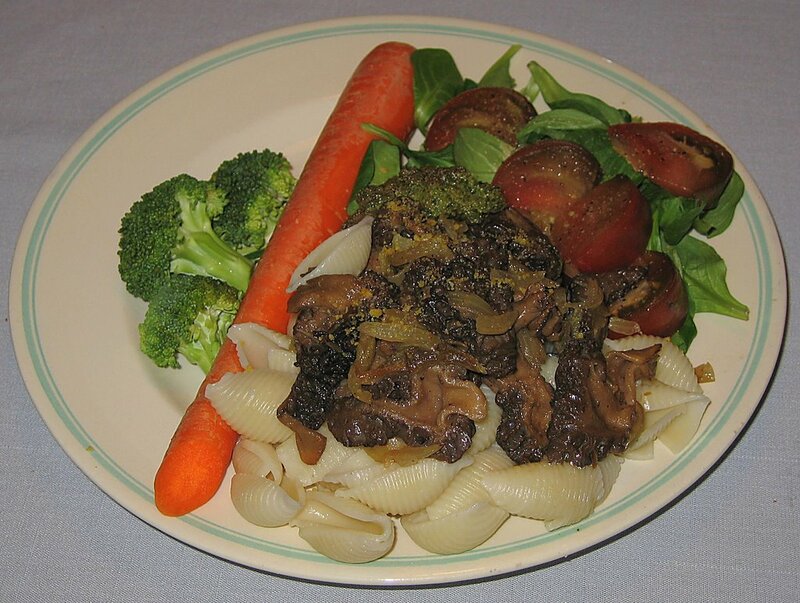 I suggested family-style serving, and ordered wedges of romaine hearts salad, an eggless rice pasta with many suggested ingredients including artichoke hearts and ... morel mushrooms (which we love! ), and fresh, mixed berries for dessert. They brought all this out, as well as a pineapple sorbet for palate cleansing after the salad course. Delicious (and expensive, about $140 including tip for the three of us, and including a delicious kiwi-based fruit juice for me)! 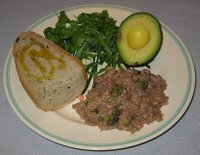 Somebody made a delicious risotto at a recent potluck that I attended, and I decided that I would learn how to cook this Northern Italian creamy short-grained (arborio) rice dish that I have occasionally enjoyed at restaurants (that use vegetable broth and no butter). 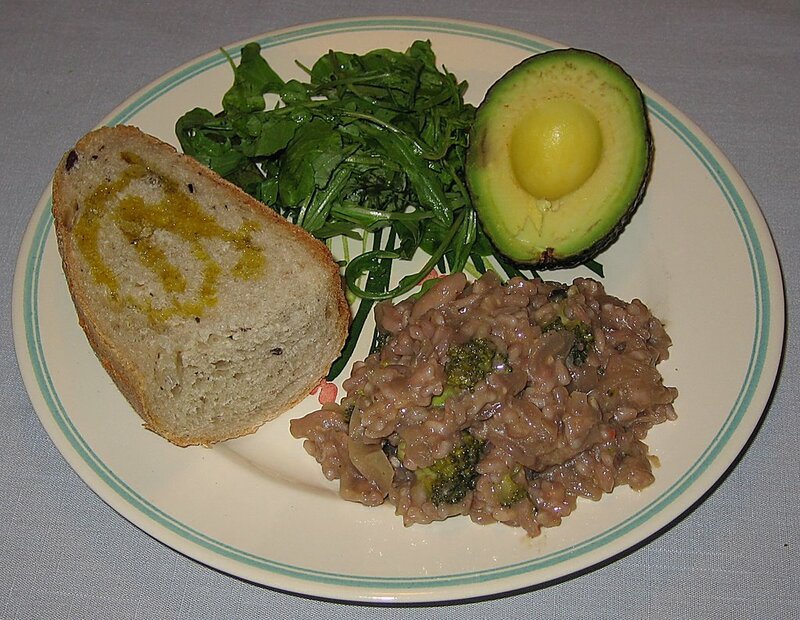 Traditionally, risotto is cooked in butter or olive oil then simmered in broth added a little at a time. Frequent stirring gives risotto its creamy texture, thickened with starch released into the broth. So this was my first try at risotto and it came out well! I was on a conference call for part of the time I was cooking it and that worked out quite well to break up the monotony of the stirring; maybe I'll call this my "multitasking conference call risotto" or something! I hope soon to make another batch to improve it further (I'm going to use white wine to keep from coloring the risotto and use spinach or maybe asparagus instead of broccoli). I sauteed about half a large onion, as well as a small handful of mixed mushrooms. Then I added a (soy) yogurt container full of arborio rice and stirred it into the oil for a minute or two. I added half of the container full of red wine and stirred till the wine was absorbed into the grain, then started adding hot vegetable broth in small quantities (about half the yogurt container or so), stirring, and keeping the rice moist but not swimming in broth. As the broth was absorbed, I would add a little more hot broth. I kept doing this for about 20 minutes, till the rice tasted done but was still al dente - risotto takes about 3 to 3 1/2 parts broth to 1 part rice. When the rice was almost done, I mixed in small broccoli florets, and once the rice was cooked, I added freshly ground black pepper, salt, and vegan Parm! "parmesan cheese", and, to make it creamier, a little bit of Earth Balance margarine. My wife and I loved the risotto! My wife brought home a lovely thin loaf of freshly baked black olive bread - it was so tasty that the olive oil I added wasn't even really needed. The dinner was good, but looking at the picture now, I wish I had added more color, such as with some slices of tomato or carrot sticks. 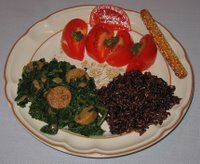 Red Russian kale with vegan "sausage"
A few days ago, I purchased some Red Russian kale with lovely purple stems; kale is very nutritious! I blanched the de-stemmed kale for about 5 minutes. 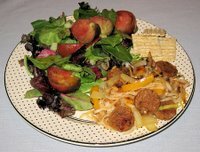 I had already sauteed some onions and a little smoked apple sage vegan "sausage". Once the kale was cooked (still firm), I mixed in the "sausage" and onion, as well as two hot sauces, and Kermit's Fresh Lime and Datil Pepper. 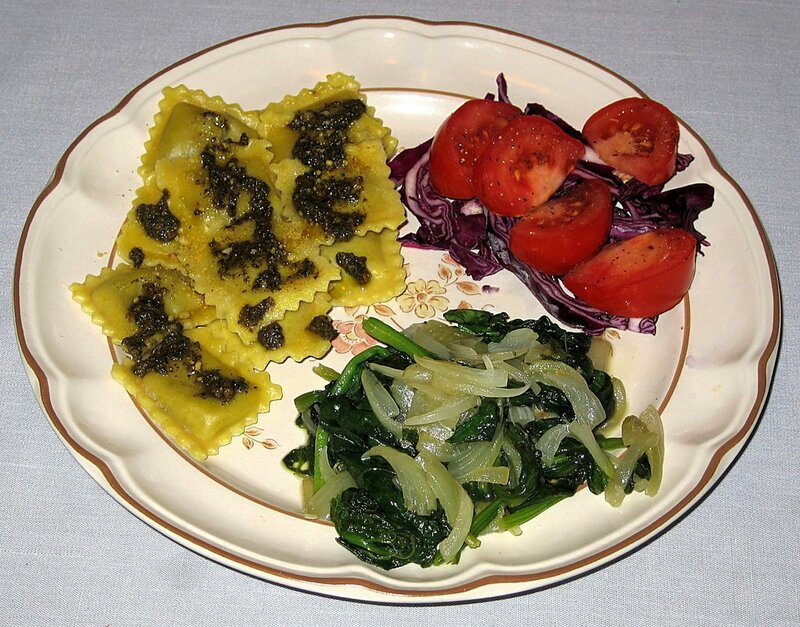 I served this with Lundberg Farms Black Japonica rice (short-grained black and medium-grained mahogany rices), kamut breadsticks, and tomatoes dabbed with my homemade pesto. I was raving about the Lemon Sourdough Boule bread that I discovered a few days ago and, though I don't usually like sandwiches for dinner, I made an exception for a combination that I came up with which is the tastiest sandwich I've had in as long as I can remember. Onto an untoasted slice of the bread, I spread a thin layer of the pesto sauce that I had made last week and added slices of tomato and spicy locally grown mesculun greens. 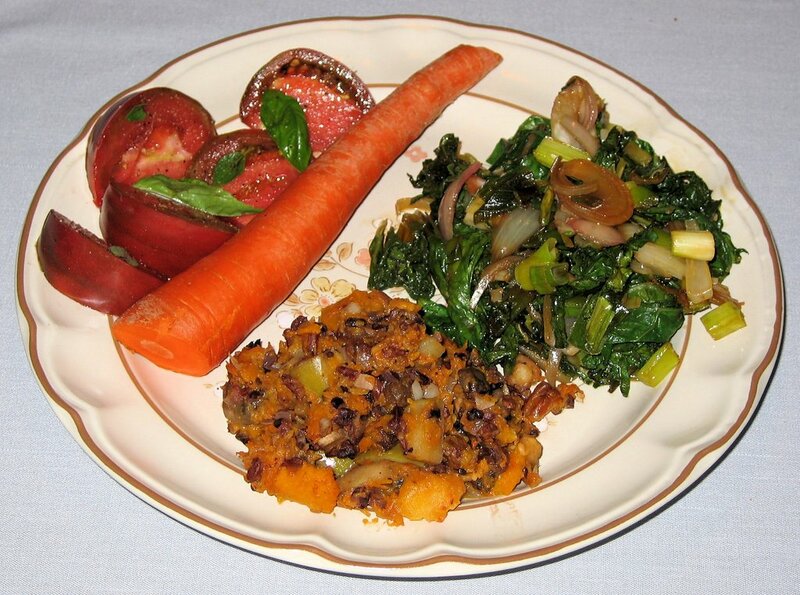 Simple but so flavorful! I sauteed some tempeh and served it with hot and soy sauces. I have this recurring problem with organic avocadoes being brown and soft inside, and today was no exception - but it tasted okay. I sauteed some scallions and yellow squash with a little mustard seed and turmeric, then put in French lentils and water (in a 1:3 ratio), brought it to a boil, then simmered for about 40 minutes till most of the water was absorbed. I mixed in salt and powdered red pepper, and served this as the main course. 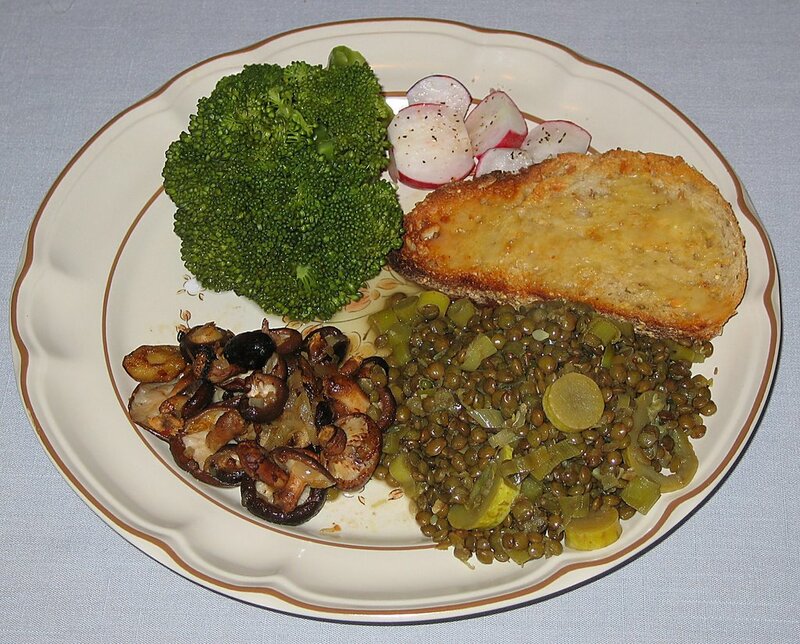 I found some excellent small shiitake mushrooms at a farmer's market, and cooked them whole along with a diced leek in a combination mostly of "butter" (Earth Balance non-hydrogenated margarine) and a little olive oil. I steamed some broccoli and served some multigrain bread toast.